Features a 34" widescreen, anti-glare, flat-panel display. 5,000,000:1 dynamic contrast ratio enables accurate color reproduction. 2560 x 1080 Full HD maximum resolution for a high level of picture detail and a clear, bold display. diagonal screen size 34 in. dimensions 15" x 32.7" x 3.3"
Sure, they look great in every room environment. But here’s what really counts: LG monitors are right in sync with your specific requirements, offering a full range of performance features. Protect your eyes from exhausting flickers and blue lights. LG’s new Flicker-Safe system is always on to reduce flicker level to almost zero. In addition, switch to Reader Mode with a simple touch of a hot key to minimize exposure to harmful blue light. Spend as much time as you want working, playing games, or watching movies without straining your eyes. Use the convenient and easy-to-use hot keys for increased satisfaction. The joystick is designed to ensure accurate menu controls and analogue sensitivity. Patterned after a conventional joystick, its modern technology and design enable simple touch controls. In addition, its intuitive UI has no overlapping functions, making it easier to understand and select desired menus. With a resolution supported by UltraWide QHD technology, the 3440 x 1440 UltraWide QHD display (34UM94-P Only) offers the sharpest picture quality never before experienced. Its pixel area is about 1.8 times larger than an UltraWide Full HD 21:9 monitor, and about 2.4 times larger than a FULL HD 16:9 monitor. Even in full screen mode, you can enjoy the sharpest images on the biggest screen. The monitor’s great resolution and 21:9 ratio make it easy to work on photos. • 21:9 Screen or 3440 x 1440 (60Hz) resolution may not be available depending on content, device, interface or graphic card. 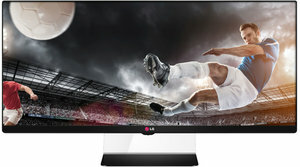 Graphic designers will surely appreciate the many features of LG's Mac-compatible UltraWide monitor. The 21:9 widescreen and 4-Screen Split will simplify working with multiple graphics windows. Disclaimer: Mac is a trademark of Apple Inc., registered in the U.S. and other countries. The 34-inch display, with a 3440 x 1440 high resolution and 21:9 ratio, provides an efficient environment for Microsoft Office programs, such as Word, Excel, and OneNote. The UltraWide QHD monitor shows 47 columns and 63 rows in Excel, so you can see all the content in full view without scrolling or hiding functions of columns and rows. • 21:9 Screen or 3440 x 1440 (60Hz) resolution may not be available depending on content, device, interface or graphic card. With a 21:9 wide screen ratio, now you can multitask with as many as four programs on one screen at the same time. This 4-Screen Split feature conveniently divides your screen from 2 to 4 customizable subscreens of your preferred size, without any overlapping of windows. Compatible with Mac, it provides 8 different screen ratios, changeable by a single click, and increases not only ease of use but also productivity. The 4-Screen Split software includes an autofitting function. With a simple drag or a double click, a new window will automatically fit into the marginal room of the screen. The large 21:9 screen is a perfect environment for efficient multitasking, enabling you to open and run an editing program and its source clip folder without minimizing other programs. • The 4-Screen Split software requires DVI-D(Dual Link), Display Port or HDMI connection with Windows XP/Vista/7/8 or Mac OS X 10.7(Lion)/10.8 (Mountain Lion) /10.9(Mavericks). The LG IPS monitor has won several prestigious awards for its utmost picture quality. It is the perfect solution for those who need the most lifelike color expression, bringing the original image to life on the screen. This stunning picture is the reason you wanted HDTV in the first place. With almost double the pixel resolution, Full HD 1080p gives it superior picture quality over standard HDTV. You’ll see details and colors like never before. SRGB is the standard color space of ideal color reproduction. So, with over 99% coverage of the sRGB spectrum, this LG monitor is a great solution for professional photographers, graphic designers or anyone looking for highly accurate color. Disclaimer: Color mode conversion between Adobe RGB and sRGB is available on the "Color Mode" menu.